The confectionary giant's product recall from 56 countries will be embarrassing and expensive, but this is nothing like the VW scandal. A Mars a day helps you work, rest and... pick pieces of red plastic out of your teeth? 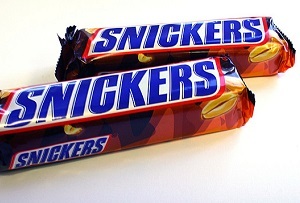 The American confectionary giant has been having a tough time since a customer in Germany found plastic in their Snickers bar in January. Although it describes this as an ‘isolated incident’, Mars has taken the painful step of issuing a product recall across 56 countries, including the UK, leading one enthusiastic Twitter user to ask whether Mars was the new VW. Having to ask people not to eat its products because they might be unsafe is enough to make any food business squirm. Though Mars didn’t confirm the number of products involved, the recall will be costly, not least because of lost revenue. Chocolate bars are standardised, mass produced products – consumers expect them to be the same every time they open the wrapper, and above all safe. How many of them will forgo their Celebrations this Easter and opt for Kit-Kats instead? So yes, this is bad. But let’s not get carried away. Mars is most definitely not the new VW. There’s no suggestion of deception, no mention of the word ‘cheat’ and no looming billions in fines. Beyond that, the red plastic problem has so far only affected one chocolate bar in the whole of Europe. Even if it turns out to be in a few more, there’s no indication yet that there was anything systemically wrong at Mars’s Dutch plant or indeed its safety processes. Things go wrong in food manufacture as in every other kind of business. You can do your best to prevent those mistakes reaching the consumer – this is, incidentally, the first product recall from the factory in question in over fifty years – but it’s next to impossible to do so every single time. ‘Everyone makes mistakes’ may not cut it with wary consumers right now, but they will soon forget. That’s what’s happened every other time a food company has had to recall products – Cadbury’s salmonella scare in 2006 may have cost it millions, but it didn’t stop people buying Dairy Milk; nor indeed did consumers ditch Maltesers after Mars found bits of rubber in them in 2007. Mars has handled this mess well, as you’d expect from a company that’s had to deal with similar situations before. Taking a ‘better safe than sorry’ attitude will reduce the risk of things escalating and makes the company appear responsible. Some people may have liked to see an actual apology, but until Mars knows what happened and what it should have done differently, it’s hard to apologise properly. Until that happens, the company is rightly focusing on keeping people safe, knowing that ‘plastic Snickers-gate’ will eventually blow over.